I am excited to share a new Personal Narrative Writing Unit that I have created that you are absolutely going to LOVE! I wanted to create a comprehensive unit that was common core aligned, includes immersion/mentor lessons for introducing the text type to students, and some lessons on author's craft! I even added a few lessons to help integrate language standards. I am really excited to use these lessons with my students. The first several lessons help students to understand the text type....What is a narrative? How do narratives tend to go? What is the structure of a narrative text? What are craft elements used in a narrative? Students will explore some of their favorite mentor texts. 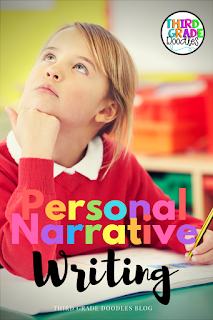 I have provided an extensive list of recommended narrative texts that I have used in my own classroom and have worked well in teaching the structure and craft elements narrative text (download this list here for FREE). 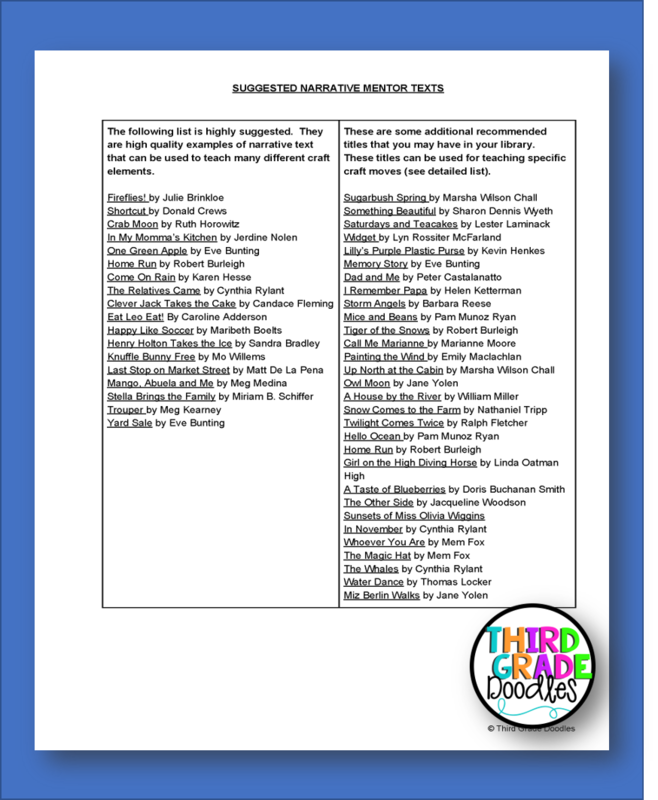 It is also nice to have a list of mentor texts that work well to teach a particular writing strategy...and I have included that too! One problem I have always encountered when looking at mentor texts is determining what exactly students should be looking for...and finding...as they notice and name craft elements. 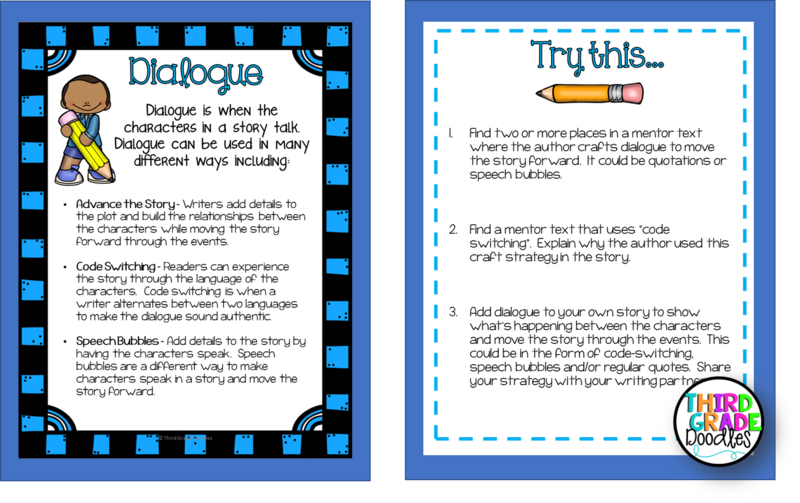 That is why I included Author's Craft Task Cards, which define several important craft strategies that author's use, and give your students the opportunity to scavenge for these in their mentor texts AND try them out in their own writing. 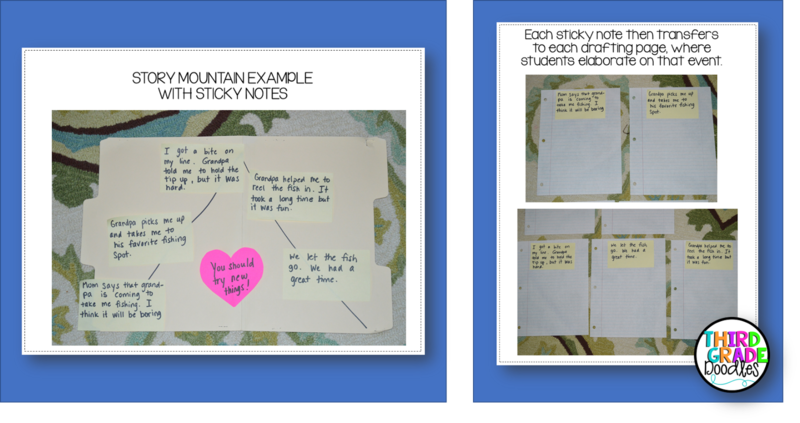 The task cards have an accompanying student workbook so students can record their thinking and ideas! TOPIC GENERATION -- WHAT SHOULD I WRITE ABOUT? Probably the most challenging thing about writing for many students is coming up with a worthy topic. It seems easy for students to come up with a small moment idea from their own lives...doesn't it??? But it just isn't easy at all!! If you have read Georgia Heard's book Heart Maps, you have discovered how powerful Heart Mapping can be in helping students find their voice and their topics!! 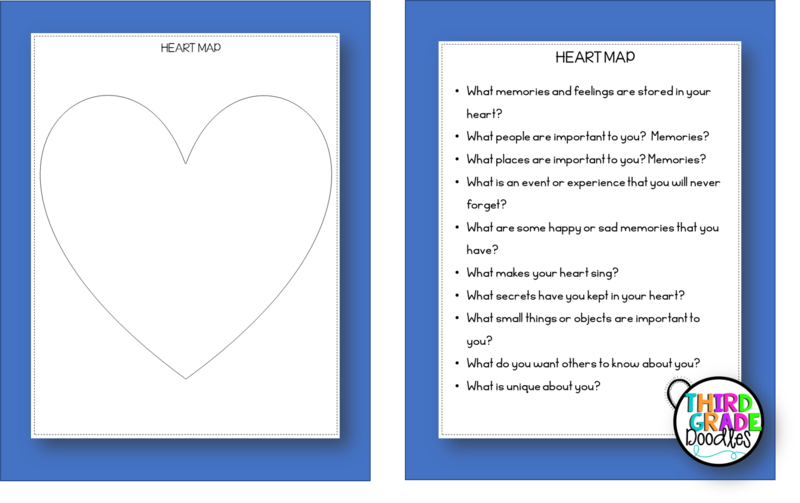 I have included two lessons on using heart maps to help students select the perfect small moment, seed idea for their personal narrative stories! GOAL SETTING - WHAT DO I WANT TO ACCOMPLISH AS A WRITER? You will show students how to set appropriate writing goals for themselves using learning targets in the form of I CAN statements. 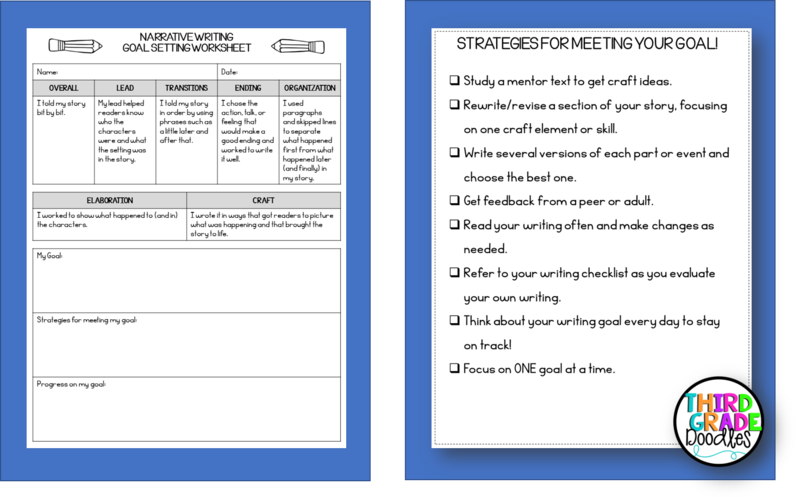 I have even included a goal-setting worksheet! 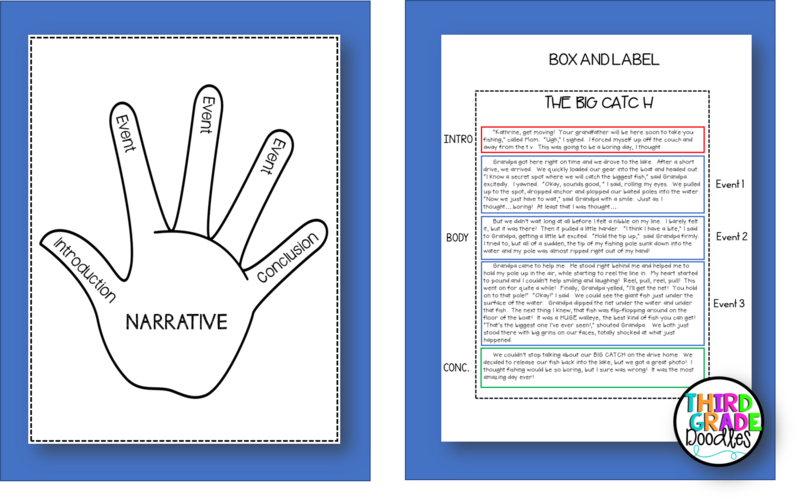 If you use Lucy Calkins Writing Pathways, this unit aligns beautifully! REHEARSING AND PLANNING - HOW WILL MY STORY GO? Pre-writing is arguably the most important step in the writing process. 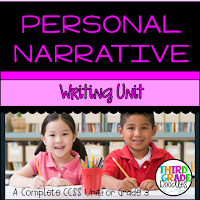 In this unit, students will spend a few days making a solid plan for their story. This includes oral rehearsal, which is a planning strategy that is very much ignored by many students (and teachers). All writer, and especially young ones, need to TELL their story before, during and after drafting. I encourage my students to go back to rehearsal throughout the writing process to help them to find their place again when their story gets a bit lost. Students can rehearse with themselves, in their head, or with a peer. I have included graphic organizers for planning, including completed teacher examples for modeling with your students. DRAFTING - HOW WILL I WRITE OUT EACH SECTION? There are several lessons on drafting including how to write the events of your story in paragraph format, drafting introductions and conclusions, using transition words and phrases. The drafting and revision steps are where students will have the opportunity to try out some of those great craft elements they studied in the first lessons! 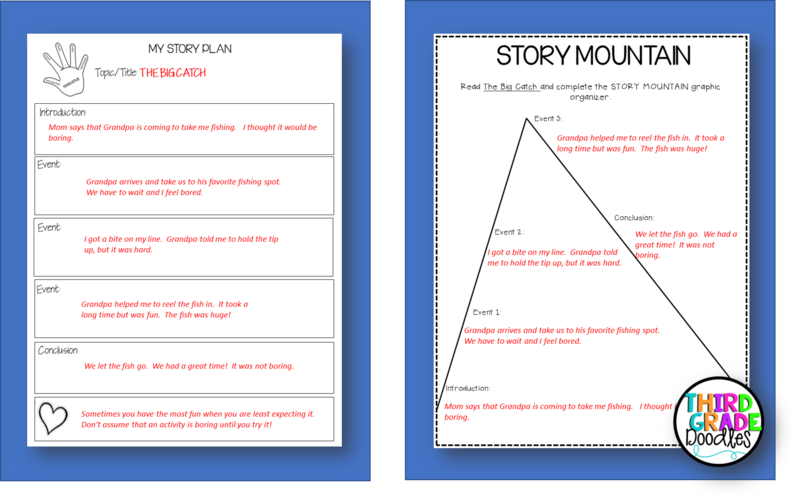 Students will use their planner (or story mountain) to begin drafting their stories. They will have "tried out" their story ideas during the immersion phase of the unit with flash drafting (for more information on flash drafting...check out THIS blog post). I like to have students write main events of the narrative on sticky notes and then use these events to elaborate each section/paragraph. HEART OF THE STORY - WHAT IS THE AUTHOR'S MESSAGE? Yes, even third graders need to have a point to their stories! It is best to get them thinking about this early on in the process. 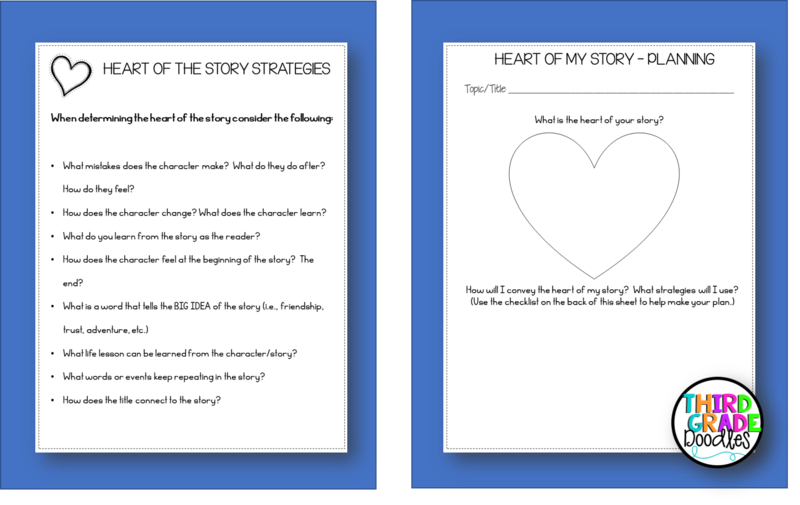 I have included a lesson on finding the heart of your story and some additional resources to help your students with this. In this unit students will explore the different ways to approach beginning and ending their narrative by looking at how their mentors do it! 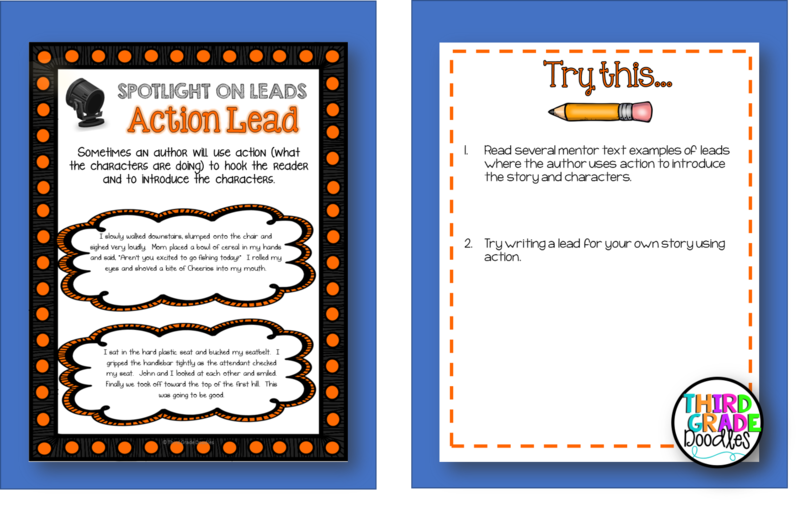 I have included some task cards that will guide students in studying great leads and endings and then trying it out in their own stories. 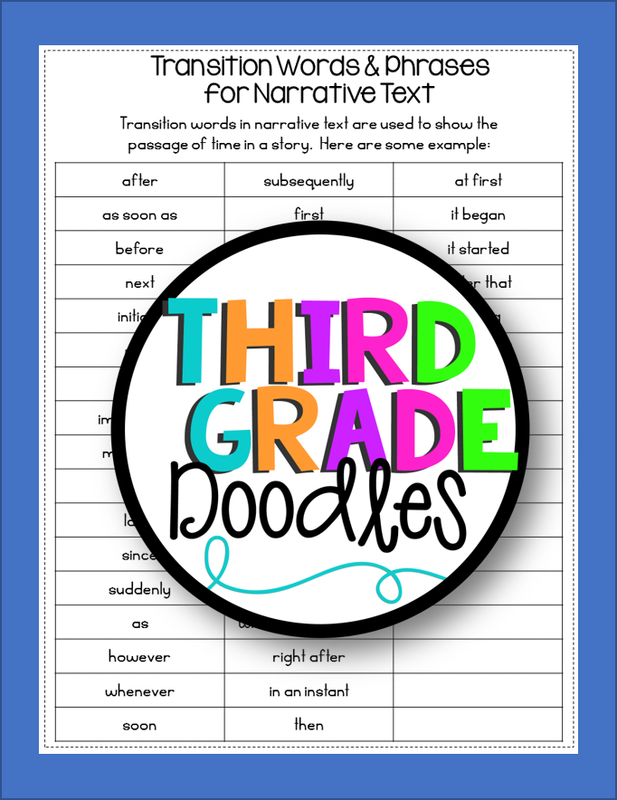 TRANSITION WORDS AND PHRASES - WHAT WORDS WILL I USE TO SHOW THE PASSAGE OF TIME IN MY STORY? Students will learn how to effectively use linking words and phrases that can be used to indicate the that time is passing in a story. Students will have access to a comprehensive list of transition words and phrases to use as a reference. FINISHING UP - HOW WILL I POLISH UP MY STORY? I have included lessons on editing, and some optional language lessons that work well with the editing steps of the writing process. I love integrating those language standards with my writing lessons whenever possible!! 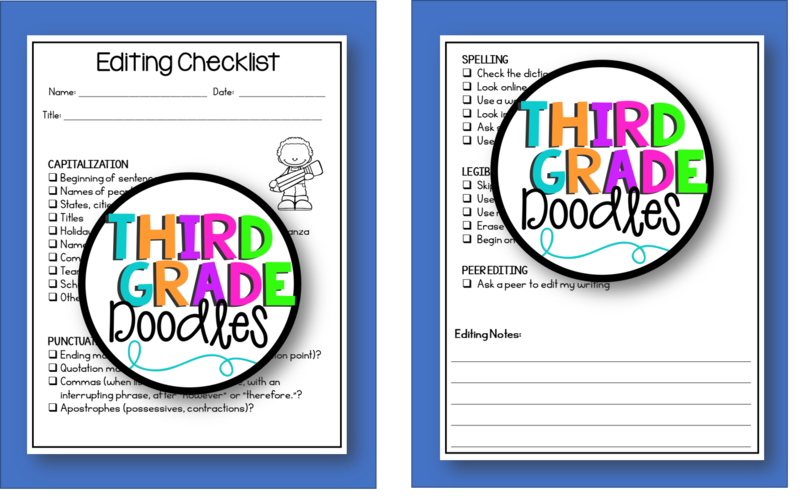 You will love the student editing checklist that is included! CELEBRATE - HOW WILL I SHARE MY STORY WITH OTHERS? There is nothing more motivating for young writers than knowing that their writing will be shared with others! 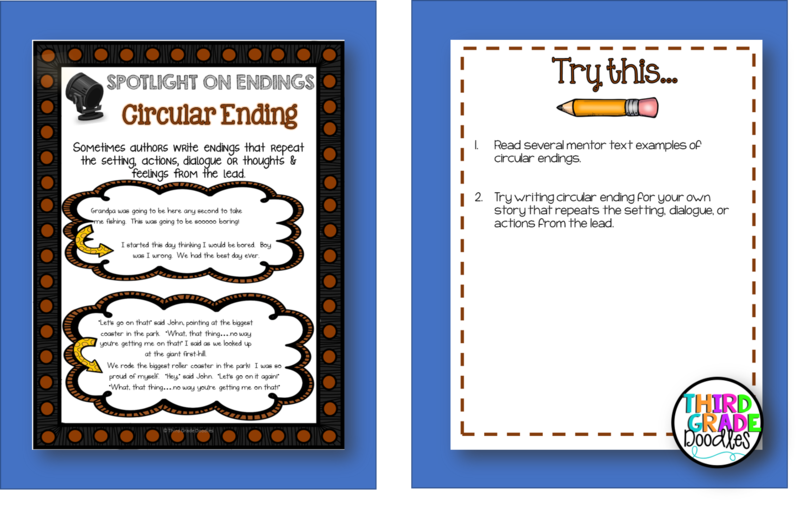 I have provided some fun ways for your students to celebrate and share their writing at the end of this unit. 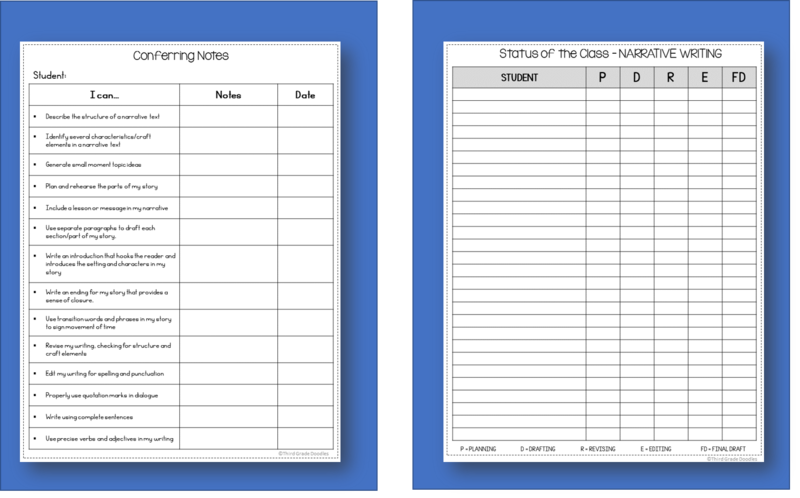 I have created some teacher tools that align nicely with the unit including a conferring checklist, status of the class sheet, strategy groups, and more. I am super excited about this unit....the lessons have been tested out in my classroom and I couldn't be prouder of the amazing narrative writing that my students have produced! I know you and your students will love it too! To celebrate BACK TO SCHOOL.....I am putting this unit on sale for a limited amount of time. Don't miss out....get it HERE today! Please feel free to leave comments and questions below...I always love hearing from my readers!! If you loved this post, pin it using the image below!